Released on July 18, 2012, CAP’s Progress 2050 and FIRE Initiative issue brief on “The State of Women of Color in the United States” takes an in-depth look at the status of women of color and makes clear that their voices are missing at a time when national demographic trends continue to shift toward women of color becoming the majority among all women. Women of color today are largely underrepresented in the national debate on key issues, including reproductive health care, women’s rights, and the economy—despite the direct impact these issues have on them personally, as well as on their families and communities. This report affirms that we are on the right path as we continue to build one of our newest networks, Standing in Our Power (SiOP), which seeks to create a platform for the voices of Women of Color to be amplified and heard. SiOP’s ultimate goal is to create new leadership practices and paradigms that will transform society as a whole. CAP reports: Women of color have made incredible strides in educational attainment and in the workplace, but their earnings and net wealth still pale in comparison to white women. They also lag behind in political leadership positions and still face unique health disparities. Their voices are critical to shaping the policies that affect their lives. Check out the entire brief. The infographic below examines the state of women of color in four key areas: the workplace wage gap, health, educational attainment, and political leadership. Over the course of three days, we connected, shared, strategized and transformed in a beautiful home where streams of sunlight flooded the space, giving life to the multi-color décor. Our stories of love, trauma, struggle and resilience were as bright and rich as the colors in the curtains, etched into artwork from around the world and painted onto walls. The first Standing in Our Power (SiOP) core leadership team retreat was held on June 6-9 at the blessed abode of core member, Shilpa Jain, in Berkeley, CA. One of my favorite memories was sitting around a large, round wooden table–that felt like it was made just for us—while we shared communally prepared food. We began our core retreat with ritual, led by Dayanara Marte (Dee) and Omisade Burney-Scott. It was a beautiful, co-creative process that allowed each of us to honor something greater than ourselves. Shilpa led a ‘Snowball Inquiry” activity that surfaced questions that are real for us at this time. It was like sewing together a quilt with disparate yet strikingly interconnected patches. From the discussions that ensued, a thread began to weave throughout the retreat in the form of an inquiry: How can we embody a new way of ‘being’ and release the constant pressure of ‘doing.’ Honoring that question, we were able to slow down, breathe and be present. We agreed that the inaugural SiOP retreat, scheduled to happen October 25-28 in Ohio, will focus, in large part, on who we want to be as Women of Color leaders. We will explore how to embody new ways of leadership and release the overwhelming sense of anxiety and inadequacy that comes with needing to do the next best thing. We then took a deep dive into some much-needed healing work with Dee and Piper Anderson through a process called “Emotional Release,” which has been developed by Dee in her work with Women of Color in the New York City. It was an incredible individual journey inward and then back to the collective. I personally uncovered traumas that I had packed away so well that I forgot they even existed. Together, we laughed, cried and held space for each other as we explored how our hearts had been broken. Meizhu Lui, our amazing elder on the core, then led us through a process to deepen our political analysis and framework. We examined historical and contemporary data that spoke profoundly of the social inequities experienced by Women of Color. This process definitely got us fired up. As Meizhu tells us: we need to know how we got here to then be able to transform our present and future. Cherine Badawi led us in a World Café process – as we walked in pairs throughout Shilpa’s neighborhood – which explored Women of Color leadership by tapping into our experiences and visions. As the retreat came to a close, we appreciated each other, shared gifts and celebrated with music and poetry. The retreat yielded a powerful draft agenda that we plan to continue refining as we finalize our list of attendees for the first national SiOP gathering. As we continue our deep listening phase and begin building the next circle that will help to develop the larger network, the energy of our core retreat guides us. These next few months will be a time to continue focusing on how to be, while we also manage a series of tasks. I have no doubt that it will also unfold and flow in a truly magical way. Our circle gathered in the outdoor pavilion, surrounded by constant birdsong and the shade of massive trees. Knee to knee with a new friend, I listened for the sentence stem I was supposed to complete: “Something I love about being alive at this time is….” My long list of responses surprised me because I’ve been so overwhelmed by feelings of frustration with the political trajectory of our country. I felt a wave of relief to be able to focus on the beauty and bounty of our world. And I was delighted by my partner’s answers, too, noting how many things we shared in common while appreciating the things that were distinctive based on our interests. We had begun our journey together by remembering our gratitude for life. This was the auspicious beginning of a 10-day Intensive in a body of practices called the Work that Reconnects. From May 25-June 3, we gathered at the stone house in Mebane, NC, to learn from pioneering eco-philosopher and activist, Joanna Macy. Developed by Joanna and her colleagues over the course of forty years, the Work encompasses a transformative process that builds personal and communal resilience. Our group included 51 people from a wide spectrum of backgrounds and identities; our ages spanned 7 decades! Through deep dialogue, ritual and personal reflection, we learned how to face the enormous uncertainty of this historical moment without succumbing to panic or paralysis. 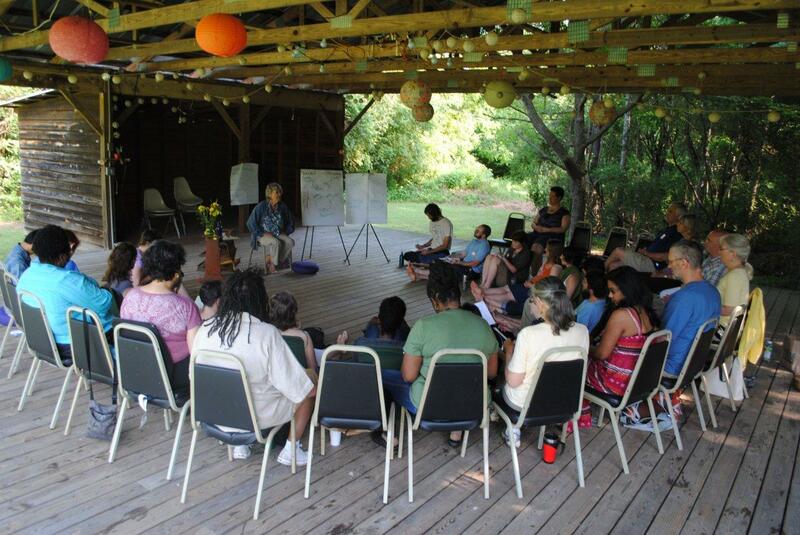 As the network weaver of EMERGE–Spirit in Action’s newest network focused on healing the divides between various ecological movements–I saw the Intensive as a vital opportunity to build the kinds of deep relationships and group skills that are necessary for our very survival. Too often in our movements, we swallow heartbreak without stopping to bear witness to one another. In order to become resilient in the face of ecological and social upheaval, we must cultivate spaces for authentic connection, information dissemination and community building among diverse groups. I am deeply grateful to Joanna Macy, her staff, the local organizing committee, the stone house staff, the donors and all the participants who made the Intensive extraordinary. I am filled with a sense of possibility as the Intensive gives birth to ongoing local and regional gatherings–“Resilience Hubs”— that will support activists to find respite and enable non-activists to learn meaningful ways to engage in issues that impact us all. We will continue to strengthen our connections that stoke the fire of positive social transformation. Our Learnings from the Pedagogy and Theater of the Oppressed (PTO) Conference in Berkeley California. From May 31-June 2, 2012 Educational Circle of Change (EdCoC) network members, Manauvaskar Kublall and Jayeesha Dutta, participated in the annual Pedagogy and Theater of the Oppressed (PTO) Conference in Berkeley, California. They presented a shortened Collective Visioning workshop at the conference around “Visioning the Future of Education.” The goal of the workshop was to demonstrate how Spirit in Action’s Collective Visioning methodology could be used in the education justice movement as a tool to create the type of education we want to see in this world. To find out what innovations emerged and insights surfaced for Manauvaskar and Jayeesha, read more below. As we thought about presenting at the conference, we reflected on our past Collective Visioning experiences. We felt confident in our ability to create a space that was inclusive and lead participants through an engaging process. We wanted to push ourselves to create something to fit this particular audience, many of whom are Theater of the Oppressed facilitators or “jokers.” We considered what we could do to further engage everyone in our workshop in a creative and participatory manner. Because Jayeesha is experienced in Theater of the Oppressed (TO), she brought a deep skillset to our workshop design. She suggested some key building blocks from TO to incorporate. The central concept of TO is to express ideas through our bodies to transform ourselves and our world, using techniques like “image theater” also known as tableau. Since our workshop was focused on education, we asked everyone to embody in a movement and sound, our current education system and then what movement or sound would embody education in our ideal world. We concluded the opening with “The Machine,” where we joined all of our individual images into one machine, demonstrating our collective vision of the ideal educational system. The movements and sounds created by our participants shifted from one of anger, pain and silence to and ones of liberation, excitement, nature and collaboration. Another building block we incorporated was paying attention to how we supported co-creativity in the space. Neither of us saw ourselves as holding all the knowledge or dictating what happened; rather, we were intentional in how much space we took as we directed the space at times, and at other times, we allowed it to direct itself. As we moved into our core collective visioning activity, participants shared personally about drawings they each created after a guided visualization. This allowed them to share their own visions before we explored connections to then arrive at our collective vision. We then had each person pass their vision drawings around and invited others to add in their own vision to each drawing. We did that about 5 times and each person’s vision grew into a collective “quilt.” We were able to guide the participants to create a collective vision by layering their ideas. We also had prompting questions preceding each layering of ideas during the pass-around. In particular, we repeated questions that were repeated from our script used in the visualization. There was great interest in the process of Collective Visioning and many participants felt excited about taking this tool back to their schools and institutions. We gave out Collective Visioning Guides and directed the rest to here to get a copy. To see images from workshop, see slide show below.